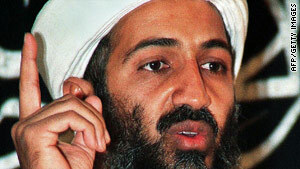 The CIA has in the past confirmed Al Jazeera reports on tapes from Osama bin Laden. NEW: Obama aide says tape tries to justify "slaughter of innocent people"
(CNN) -- A new audio tape allegedly from al Qaeda leader Osama bin Laden claims responsibility for an attempt to blow up a plane en route to Michigan on Christmas Day and warns the United States of more attacks. The tape, which aired on the Arabic-language news Web site Al-Jazeera on Sunday, says "the United States will not dream of enjoying safety until we live it in reality in Palestine." The tape continues: "It is not fair to enjoy that kind of life while our brothers in Gaza live in the worst of miseries." President Obama's senior adviser David Axelrod told CNN's "State of the Union" on Sunday that while there was no immediate confirmation that the message was authentic, it "contains the same hollow justification for the slaughter of innocent people." In another section of the audio tape that Al-Jazeera broadcast, the voice says: "God willing our attacks will continue as long as you support the Israelis and may peace be on those who follow guidance." Video: New threat against U.S.? Bin Laden also claims responsibility for the foiled attack on Delta flight 253 in December. "The message intended to be sent to you was through the hero fighter Omar Farouq, may God release him, confirming an earlier message that the [September] 11th heroes delivered to you and it was repeated before and after [that event]," he says. A Nigerian man, Umar Farouk Abdulmutallab, has been charged with attempting to blow up the Delta Airlines plane as it approached Detroit from Amsterdam, Netherlands. "Al Qaeda in the Arabian Peninsula was behind the failed attack on Christmas Day. That's clear," a U.S. counterterrorism official -- who is not authorized to speak publicly -- told CNN. "So a message like this -- no matter whose voice it may be -- should come as no surprise. Al Qaeda has, from time to time, tried to build support for its program of murder by talking about the Palestinian issue. That line's never gotten them much in the past, and it's unlikely to now, either." Bin Laden had six messages in 2009. The last was on September 25 and was "to the European people." In that message, he urged the countries to reconsider their involvement in the Afghanistan war. "Today Europe is suffering an economic crisis, and its export reputation doesn't hold true anymore, while America is bleeding economically because of all the wars it is involved in," his last message said. "Think about how Europe will fare when America pulls out of Afghanistan. You will be left to suffer alone the rage of the people you oppressed." A security expert said there's a possibility bin Laden did not know about the attempted attack in December and al Qaeda branches may be using it to prove themselves to the group's leadership. "They were able to get their man on an American plane on an American soil so it is successful by all means," said Mustafa Al-Ani at the Gulf Research Center. "The strategy is there, outlined by the mother leadership and now we will see the branches doing their best to please their leadership and implement al Qaeda vision in their own ways." Bin Laden is thought to be hiding in the Pakistan-Afghanistan mountain region, according to intelligence experts.